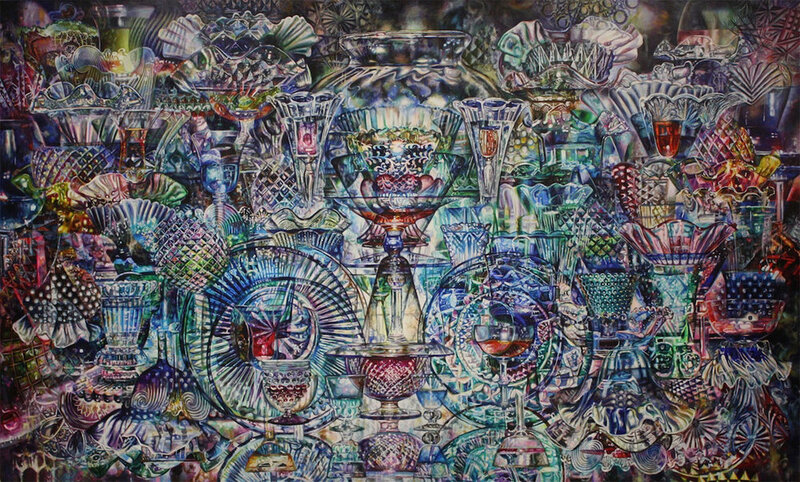 For years, artist Robin Jebavy has been making densely layered paintings of glassware arrangements with a focus on fusing the unbounded expanse of the inner, intuitive world with private, domestic environments. Glass Utopias, experiments with glassware imagery to reference our fragile and often precarious human condition and ask questions about our intimate relationship with the external world. For years I've been experimenting with glassware imagery—a reference to our fragile and often precarious human condition—to ask questions about our intimate relationship with the external world. Drawing inspiration from a number of historical and contemporary artists who ingeniously explore(d) the reflective, revitalizing and revelatory potential of the still life, I play on and expand that investigation by considering the physics and metaphysics of objects; our experience of cultural materialism; the relationship between nature and abstraction; and the fusion of our inner world's unbounded, intuitive expanse with private, domestic environments. In my paintings, seeing is being; the first-person viewpoint of the still life replaces the traditional, third-person perspective of objects. The simple glass vessels that I use to make preliminary tabletop arrangements are at once functional containers (such as goblets, bowls, cups, flutes, and decanters)—that I fill with evocative, colored liquids to engage our senses—and conduits into liminal, ecstatic states of being. 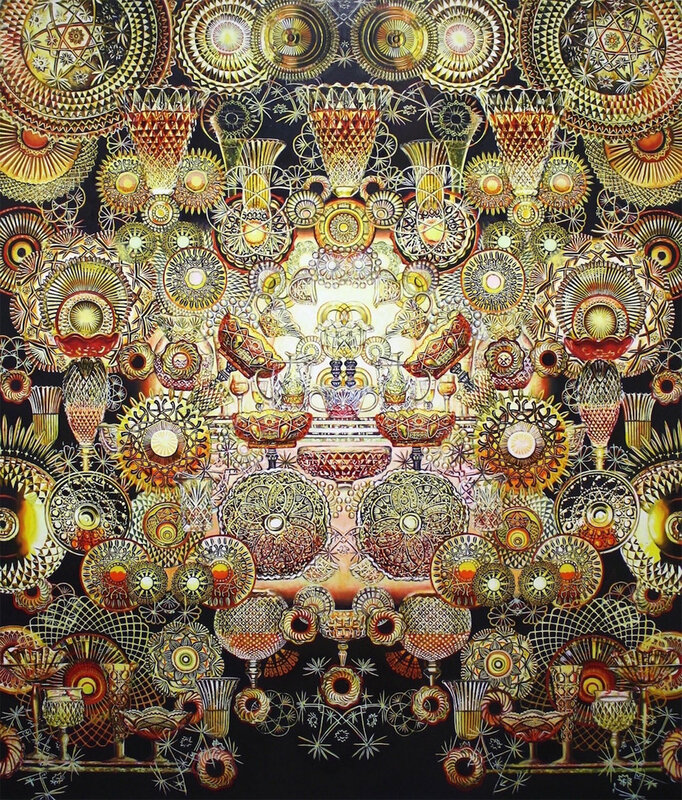 The glass radiates a multitude of layered patterns and refractions, drawing the viewer into a wondrous world. I see that component of the work as essential to my vision and quest; its purpose is neither to merely celebrate provincial, homey notions of beauty nor to critique consumerism in our culture. However, to some viewers the glint on the glassware calls to mind the elegant but ornate depictions of glass vessels, shiny pewter and other objects that symbolized luxury and the emptiness of material wealth in 17th century Dutch 'vanitas' paintings. I share with the Dutch a love of technical facility and rigor, intricate passages in painting, and the existential concerns about materialism affiliated with the still life, but the objects I work with have a different social and historical meaning. My glassware collection is comprised mostly of pressed glass pieces (from the Goodwill or antique shops) that were made in the early-mid 20th century. They were supposed to resemble unique and exclusive cut glass, but through the process of mass production lost their meaning as social symbols of wealth. Today we see these objects as they are for us: common and accessible if not mundane—a glass of the people. The theme of mortality explored in Dutch painting, though, certainly still lingers as a relevant contemporary issue as artists continue to grapple with the metaphysics of the still life. Do inert objects urge us to contemplate the transience of life, as they did in Dutch Golden Age painting? Or are they—illuminated by 21st century physics—immaterial, animated, fluid impressions of evolving forms created by underlying energy forces that are endlessly moving? 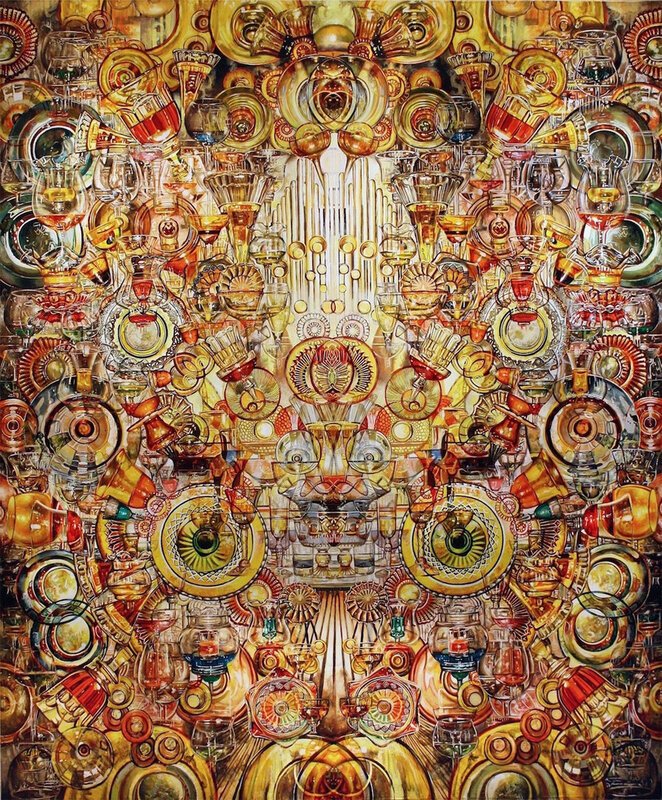 I use glass to explore this interplay of forces through a repetition and expansion of patterns; each painting moves from an initial simple reference of still life forms toward something immersive and infinite—an embroidered, reverberating network of shapes and colors into which the viewer can fall and get lost. The paintings are like living, dynamic organisms composed of illusory, fragments of experience—elemental, mystical and personal utopias that hover before our eyes. As much as the paintings are soft, dreamy and tenuous, they are muscular and intensely structured; I often consider the intersection of painting and architecture as I include glass pieces that call to mind cathedral interiors—suggesting their stain glass windows, massive architectural supports, fine ornamentation, and decorative flourishes. The nearly symmetrical edifices that emerge often exude a cathedral-like energy, evoking oceanic feelings of sublimity and beauty; modest objects take on a monumental presence as they spiral off the tabletop and expand far beyond the domestic interior. ROBIN JEBAVY has been exploring glassware imagery in painting for many years, drawing inspiration from still life artists including the 17th century Dutch Masters, Paul Cézanne, Giorgio Morandi, Janet Fish, and Beth Lipman. 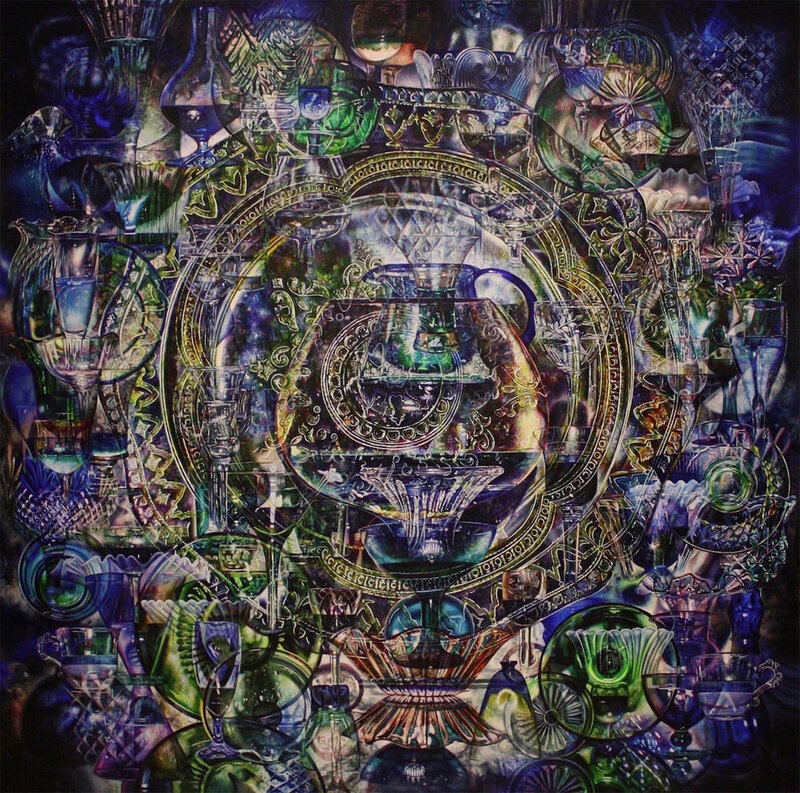 Jebavy first experimented with the representation of glass at Bennington College where she received her BA in Visual Arts and Philosophy in 2004; and later at the University of Iowa where she earned her MFA in Painting and Drawing in 2008. She has since shown her work at a number of venues across the Midwest, including the Lynden Sculpture Garden and Portrait Society Gallery in Milwaukee, and Iowa Contemporary Art in Fairfield, Iowa. Jebavy was a 2014 Robert Johnson Fellow at the Virginia Center for Creative Arts, and received a 2016 Mary L. Nohl Fellowship in the emerging artist category. Was there a person or event that got you started creating your art? Does that person or event continue to influence the work that you do? Yes. I grew up in a creative family. My father is an artist and a retired art teacher. When I was a child we did lots of art projects and regularly visited the Milwaukee Art Museum and the Art Institute of Chicago. His love and support continue to be of inestimable value today. We share a passion for philosophy and ideas; his perspective on the world often influences my vision as an artist. At what point did you consider yourself an artist? I've always thought of myself as a creative person, but it wasn't until midway through college that I saw my potential to someday offer a unique vision to the world. I remember making a painting with passages in it that made me feel how I felt when looking at the work of artists that I considered great. At that point I believed that someday I could be one of those artists. And it is true: with tenacity and hard work, if you think you can do it, you can. I'm inspired by books, philosophy, films, the work of contemporary and historical artists, mythology, psychology, science, family, and life experiences like love and loss. I'm especially invigorated by the joy of making itself, and the experience of being lost in a creative zone for many hours. It's a perfect kind of exercise/engagement that offers a much needed extra dimension of experience that melds the physical, emotional and intellectual aspects of life. What was the first piece of art you made? Do you remember why you made it? What materials did you use and why? I always loved to draw. The first artwork I remember making was a crayon portrait of my dog, Rio, when I was two. Art, among many things, is an indirect way to express affection, so I'm sure I wanted to show how much I loved dogs. Are there any programs or learning opportunities that you wish you had as a young artist? For the most part, I was very lucky to have had an excellent art education, especially after high school. During college, I did a semester abroad in Florence, Italy, which was an invaluable experience for me as a young artist. I took a drawing board with me to various streets, plazas and museums, and spent most days sketching marble sculptures, interiors, fountains, and cityscapes. The light and architecture in the city--as well as great paintings by Caravaggio, Botticelli, Raphael, etc--opened my eyes profoundly. I also did a wonderful summer studio program at the Pennsylvania Academy of Fine Arts to study portraiture. It gave me a strong understanding of the human head. I was making a lot of portraits at the time, so that was really exciting. I do wish the high school I attended had a better art program. Young artists need the benefit of a strong, sophisticated foundations education that offers an in-depth introduction to the technical, formal, and conceptual aspects of making and appreciating art. Be patient. It takes a lot of practice, failure, and struggle to make advances as an artist. If you have faith and stick with it, you'll eventually get to the place you want to be. Get as broad an education as you can by taking classes outside of your discipline, and look at the works of tons of artists. It's great to apply hard work and focus to a specific technique or subject matter that you love, but continued experimentation outside of that interest will only make your work stronger, and connect it more deeply to the greater world of art. Rejection is common and inevitable, unfortunately, so don't be too discouraged by it. Find consolation in your love of creating, and continue to make the art that you truly want to see, even if it's not accepted. It often takes culture a while to digest anything that is new and unfamiliar. Write about your art. Writing an artist statement can be a daunting task, and often frustrating; the meaning artists experience in their work is often purely visual, unconscious and ineffable; but sometimes taking the time to analyze your thoughts about how your work fits into a broader contemporary context can be insightful, and might prompt new ideas and directions. It also gives viewers a way to relate to and enter the work better than they might without an introduction. Is this your first and only career? If not, what other jobs have you had and how have they influenced your artistic practice? I haven't had any other career paths, but did study quite a bit of philosophy in college. I often wonder how a serious investment in philosophical research and writing would have influenced my artistic practice. It is hard to imagine a meaningful dedication to both fields since my paintings require so much time and commitment. Do you like people to see your work/comment on it while it is still in process? Why? I usually don't like to discuss in-progress work, and tend to keep a fairly private studio. Occasionally I want an artist with a technical understanding of painting to give me her/his thoughts on a piece in its early stages; and sometimes I like to open my studio to students and/or artists to give them insight into my process; but when visitors see an in-progress painting they often say things like, "I think you should stop now. I like it the way it is." Sometimes a person's thoughts are delightfully insightful, making me think about my work in fresh and unexpected ways; but in most instances the comments aren't helpful, because each painting is an attempt to express a unique vision; only I can know when I've done that. When I look at a painting and it feels right, I know it's time to move on to a new project. Do you have a daily artistic ritual or routine? If so, how does this help you? I don't have a really strict routine, but do like to paint for at least six to fourteen hours a day when I have the free time. I set little goals as I work to make the process of executing a detail-intense painting more manageable. Short breaks throughout the day, exercise, and a nap are really helpful and reinvigorating. The ritual of cleaning brushes and the studio right after a painting session is important so a fresh space welcomes me when I resume. What inspiration/research led you to your current body of work? Well, glassware has appeared in my paintings for about twelve years now. As a child, I was fascinated by 17th century Dutch Golden Age painting. I would stand transfixed in front of exquisitely rendered still lifes of glass vessels, pewter goblets, and various natural forms. As I grew up, I recognized these painters’ feats of meaningfully engaging with the representation of functional objects to pose metaphysical, enduring questions. In college and graduate school, I saw the works of Janet Fish and Beth Lipman, whose elegant uses of glass instantly brought me back to the Dutch. These contemporary artists inspired me to experiment with the representation of glass in my paintings, which at the time were composed of figures in interior spaces fragmented by a heavy play of light and shadow–reminiscent of Hopper, Vuillard, and Vermeer. Slowly, the depictions of glassware pieces in the paintings took over and got bigger until the figure, the room, and the tabletop (in some instances) were crowded out. Over the years I've found glassware to be a subject matter that keeps giving–one that has taken me on a truly unexpected path. It has enabled me to concurrently deviate well beyond the typical constraints of the still life tradition, and contribute meaningfully to the ongoing, historically rich dialogue about our engagement with, and understanding of, the objective world. What caused you to gravitate toward the materials and processes you are currently using? In college and graduate school I was firmly grounded in the use of oil paint. The lushness and translucency of the medium seemed impossible to beat. However, a few of my peers said they could envision my work in acrylic, which got me thinking. Later on when I started working at home, I became concerned about living with toxic solvents and mediums. After being awarded a five-week residency at VCCA, I decided to give myself a challenge: to try to make a painting with acrylics that mimicked the richness of oils (I also did this for practical reasons; the residency was short and the painting had to be dry before I could mail it home). I was surprisingly pleased with the luminous result; and I loved that I could work quickly, applying several layers in one day. I've been working with acrylics ever since. The following questions are intended to offer insight into the artist’s current work and what they intend their audience to understand. What role does process have in your work? For each piece, my process involves doing a preliminary photo shoot of glassware arrangements, generating a complex digital montage from a selection of the photographs, and referring to that montage to carefully execute the painting. Instead of slowly developing areas across the canvas section by section, I tend to focus on the “big picture” first, working all over loosely and generally for several layers. It’s only months into the painting that I attend to any detail. Emily Dickinson said, “If I feel physically as if the top of my head were taken off, I know that is poetry.” When I look at the painting and experience that kind of elevation—when analysis takes a backseat to feeling—I know it’s finished. What is the one idea/thought you hope people will have/take away with them after viewing your work? That seeing is being; the boundaries we experience between self and other, and self and world, are illusions. Responding to the world and life experiences through visual expression is a completely exhilarating experience; creating art is an outlet the uses a visual language to tell personal stories and ask big, universal questions. It’s a wonderful way to be part of the world by engaging with contemporary issues while also contributing to the ever-expanding history of ideas. What role does the artist have in society? Why do you think art is important to society? The artist opens us up to dialogue about our current situation and place in the world, and asks us to ruminate on enduring questions—questions that people have been asking since time immemorial—about what it means to be human. Art offers powerful feeling, thought and insight that rejuvenates and sustains us in a dark and troubling world. It’s a magical thing that connects us deeply to our ancestors and to each other—something that encourages us to think critically about our civilization and to stay open and alert to unlikely connections and new possibilities on the horizon. Why do you think it’s important to support the arts? Many people are in the habit of taking the wonderful experiences that art gives us for granted, forgetting that they are often the result of years of an artist’s intense research, concentration and commitment—things that are impossible without adequate time and support. For artists to make valuable contributions to society, society must give back to artists, and to organizations that support the arts.